Located in the state of Washington, Mount Rainier is part of the Cascade Range of the Pacific Northwest. It's the highest mountain in the state and the highest mountain in the entire range. Mount Rainier is a stratovolcano and is active, being classed by experts as one of the most dangerous volcanoes on the planet, posing a potentially huge and destructive threat to the surrounding area, including the nearby city of Seattle and its surrounding metropolitan area. Mount Rainier has a prominence of 13,210 feet (4,026 m) and is the 21st most prominent peak in the world, and the fourth most prominent in all of North America. It's also one of the most isolated peaks in North America and is classed as a Decade Volcano due to its active nature and proximity to urban areas. The mountain was observed by Native Americans many years before settlers arrived on the continent. The native Salish peoples had various names for the mountain including Tahoma and Talol. The mountain was given its new name by George Vancouver, who named it after his friend Peter Rainier. Mount Rainier has represented an exciting challenge to climbers and mountaineers for many years, with the first successful ascent occurring back in 1870 by Hazard Stevens and P.B. Van Trump. Van Trump returned with Fay Fuller two decades later, with Fuller being the first woman to make it to the top. Over the years, as climbing techniques and technology improved, many more successful climbs of Mount Rainier were recorded. The elevation of a mountain tells us how high it is above sea level and shouldn't be confused with prominence, which is the term given to denote the height of a mountain in relation to its base. The prominence of Mount Rainier is 13,210 feet (4,026 m), which is actually higher than K2, the second highest mountain on Earth. However, the elevation of Mount Rainier is 14,411 feet (4,392 m), which is much lower than some of the world's highest peaks like Everest, which has an elevation of 29,029 feet (8,848 m) and K2, which has an elevation of 28,251 feet (8,611 m) above sea level. The highest mountain in North America is Denali, which has an elevation of 20,310 feet (6,190 m) above sea level. Mount Rainier is situated in the Mount Rainier National Park, which has a base elevation of 1,600 feet (488 m). This means that a climb up Mount Rainier results in a very high elevation gain. Mount Rainier is the highest elevation point in the state of Washington, which has a mean elevation of just 1,700 feet (520 m). Due to its huge elevation and impressive prominence, Mount Rainier can be seen from dozens of miles away and is a key part of Seattle's surrounding landscape. Climbing Mount Rainier takes two to three days on average and involves a vertical elevation gain of over 9,000 feet (2,743 m) in total. The climb does feature some technical challenges and anyone who attempts it needs to have a good level of physical fitness and will strongly benefit from some prior climbing experience. Two of the key camps along the ascent of Mount Rainier are the high camps of Camp Muir and Camp Schurman. Camp Mui is located on the southern side of Mount Rainier and has an elevation of 10,080 feet (3,072 m), while Camp Schurman is situated on the east of Mount Rainier and has an elevation of 9,440 feet (2,877 m). Both camps are equipped with Ranger Stations and toilets. Climbing many major mountains around the world comes with a risk of altitude sickness. The effects of this condition can begin to be felt at elevations of 8,000 feet (2,438 m). Altitude sickness produces symptoms like nausea, vomiting, headaches, and shortness of breath and is caused by the fact that the air becomes thinner and colder at high elevations. Anyone planning a trip to Mount Rainier must therefore be prepared for this possible eventuality. Not everyone is affected by altitude sickness, but it does often have an effect on new climbers and people who spend most of their lives at low elevations. 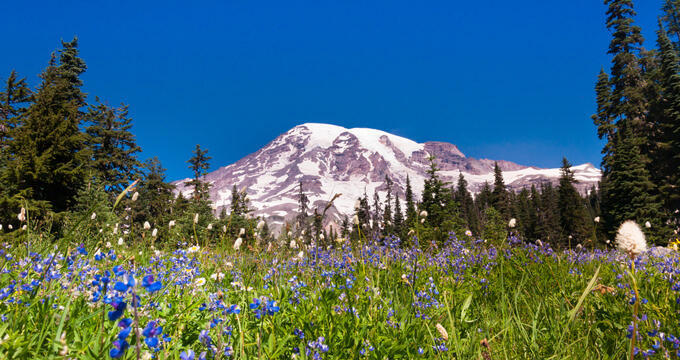 Given that many major cities around the United States are situated at elevations of 500 feet (152 m) or less, it’s always likely that inexperienced climbers from these locations will suffer altitude sickness on Mount Rainier due to the mountain’s extremely high elevation of 14,411 feet (4,392 m).